Sally with her new book – a chilling story about a girl carted from foster home to foster home who is being haunted by a ghost…or is she? Sally is a friend of mine and I went to her book launch a few weeks ago. I loved her first book WAYS TO LIVE FOREVER, but although I thought ALL FALL DOWN was an epic read, I didn’t connect with it in so well. So I wasn’t sure what to expect from CLOSE YOUR PRETTY EYES. 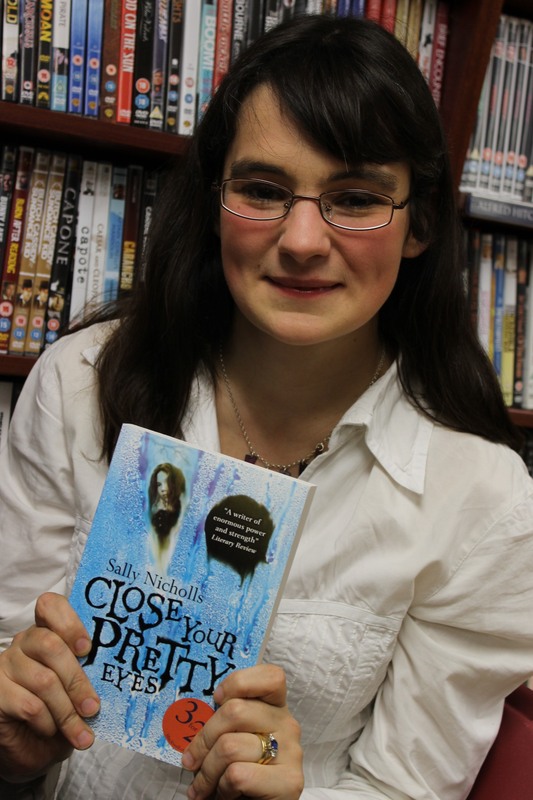 Sally is a highly versatile writer and she loves to tackle unusual topics or present more common ideas in a new way. I didn’t need to worry: I LOVED it. Olivia is eleven and has been shunted from foster home to foster home for years and years. Having no permanent family when you’re that young leaves lasting damage, and Olivia has developed massive personality issues. She gets angry very easily (often on purpose) and she feels safer when she’s behaving badly because she knows what the consequences will be. She often initiates a confrontation because she feels in control of it. She’s been let down SO many times by so many people, and Sally’s book takes us through this process, in reverse. We see Olivia’s story backwards, and each nugget of information helps us to understand and empathise with this very damaged and needy child. Whether Amelia’s ghost is real or not isn’t really up for discussion. The point is Olivia is convinced she is real, and is trying to make Olivia kill the baby in the household – Maisy, daughter to teenage mother Grace. Olivia knows that she herself is a dangerous person, but she’s never felt such a desire to hurt someone before. I was on tenterhooks throughout the book, hoping so much that Olivia would be able to fight her destructive urges. She’s so used to being ‘the bad one’ it’s hard for her to fight the ghost because it means she’ll have to change something about herself. Obviously, I can’t say what happens, but it was enormously satisfying to read. Olivia is a vibrant character with such a rounded personality that you convince yourself she’s real. Her background story is all the more heartbreaking because you know that there really are kids like her, let down every step of the way, and then blamed for the person they become. The book is divided into short chapters (one of Sally’s trademarks) which makes it pacy to read. I would have read it much faster if I weren’t so tired in the evenings! The writing is accessible and stylish (two things very hard to pull off together) and the ending is perfect. I gather some people think it’s bleak – I don’t at all! It HAS made me think a lot about the care system in this country and how very underfunded it is. Financial inequality makes me spitting mad. The richest people in the UK have SO much and yet the poorest are ALWAYS the ones hit hard by government cuts. As I write, I’ve just heard that 37 of the 44 children’s centres in Oxfordshire (my county) are under threat of closure. These are places parents can take their babies and young children for help and support and advice – all things that could have helped Olivia’s mum be a better mother to her children. Why do we constantly make things harder for people to have children? Sally’s book is brilliant, and I’m not saying that because she’s a friend (besides, I didn’t like All Fall Down half as much). Five gold stars. Read it. Looking at the Stars – what’s it all about?